Doing three A-Levels in digital based subjects has definitely given me an advantage when it comes to Photoshop. Now, I'm certainly no expert, but I'd like to think that I'm a bit of a whiz (and I kinda love doing it) with collages and editing and the creative side of computers. 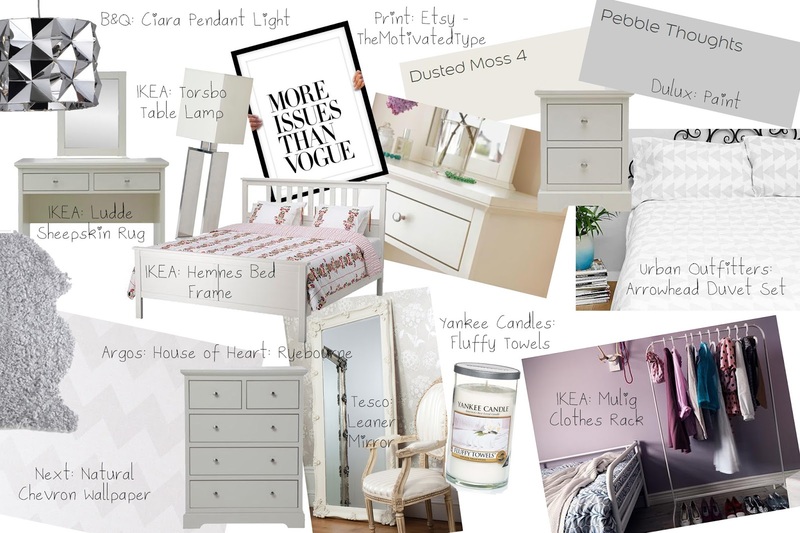 So, the other night I just could not get to sleep, so I made a cheeky moodboard for my new room (eek how exciting!). If you're redecorating or you want to just buy a few cute bits for your room, then check this out for a bit of inspiration! My current room is a disaster, I'm just going to put that out there. Badly painted walls, old furniture full of stickers (I've had my desk since I was, like, five...), mismatching decor...my room would make an interior designer cry to be honest. Walls: After being stuck with raspberry pink walls after a crazy impulsive choice back in 2012, I've regretted them ever since. Now I've gone for two tones of grey, because they're not just white and boring, but they're still neutral and colours that I won't get bored of. I chose Dulux Paint in Dusted Moss 4 and Pebble Thoughts to have two contrasting walls, and then I thought about having a feature wall with the Next Natural Chevron Wallpaper on the opposite wall to the Dusted Moss 4 one. Something like that. Furniture: I searched everywhere for the perfect furniture, and I found some that even beat IKEA in my eyes. I chose the Argos House of Heart Ryebourne Range for my chest of drawers, side table and desk. They're white and simple but still look gorgeous and have some character to them. Obviously IKEA had to come in somewhere though, so I went for the IKEA Hemnes Bed Frame and the Mulig Clothes Rack. I think that the clothes rack is a cute alternative to a wardrobe and I will probably put up my main black and white clothes so it coordinates with the room! Mirror: Finding an affordable wall-to-floor vintage mirror was the hardest thing to do. To my surprise, I found this White Leaner Mirror from Tesco, and I love it so much. It goes with my furniture, and it's perfect to prop up against the wall to create an additional illusion of space! Bedding: I went for the Urban Outfitters Arrowhead Double Duvet Set in Grey, because it matched perfectly with my room and it's such an interesting pattern without being overwhelming. They also have pastel green and pink colours if you preffered, but I've said I think the neutral the better. Additional: I wanted to keep with the neutral theme, but to add some cute metallic stuff, so I went with the Ciara Pendant Ceiling Light from B&Q and the IKEA Torsbo Table Lamp. They're so unique and add a bold touch to my room. The 'More Issues Than Vogue' Print from Etsy is by a company called The Motivated Type, that has loads of typography prints to choose from, and I can frame this one and put it up above my bed, how glamorous. The rug also is slightly glam, it's the IKEA Ludde (Fake) Sheepskin Rug, and it's super soft and perfect for the size of my room. And finally, to finish off my chic/neutral/slightly glam room, I've added a Yankee Candle (of course!). I went for my all time favourite, Fluffy Towels. This fresh scent is something you'll never get bored of, honestly. I hope you picked up some ideas and tips!